Mister Wood is an interior wood finishing service company. We offer on-site custom finishing projects. Whatever the wood, whatever the colour, our master finishers and colour matchers are experts who deliver fine finishes for the finest homes and establishments. Mister Wood is a family owned business and has been established since 1972. 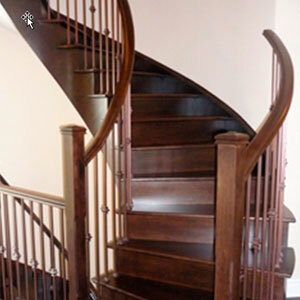 We enjoy an excellent reputation throughout the Greater Toronto Area, having completed many projects, large and small. We welcome the opportunity to estimate any job of any size. We are uniquely qualified to provide on-site custom lacquer finishing in sheens ranging from matte and satin to glossy. Our finishers work well with the builder, architect, designer or homeowner as well as with all on-site trades for access and scheduling. On every refinishing project, our highly skilled crew maintains a care for detail that is unmatched in the industry. Upgrade the look of an existing residential or commercial property. We are able to match your old staircase with any of the new colours available in new prefinished floors, which have become so popular in recent years. We welcome the opportunity to estimate any job of any size and samples are available upon request. Call now for a free estimate.